March 24: NATO launches air campaign, with the goal of crippling the Serbian war machine in Kosovo and enforcing compliance with the international peace plan drawn up at Rambouillet, France. March 26: The first of a massive tide of refugees arrive in Albania. March 27: A US F-117 Nighthawk STEALTH fighter is shot down near Belgrade but the pilot is recovered. March 31: Three US soldiers are captured by Yugoslav forces after an incident on the Macedonian border. April 1: Moderate Kosovar leader Ibrahim Rugova is shown on Serb television talking with Yugoslav President Slobodan Milosevic. April 13: Incidents on Yugoslav-Albanian border. April 14: Yugoslavia claims that rockets fired by allied jets killed 75 people in two separate refugee columns. NATO later admits accidentally hitting a civilian vehicle. April 20: Russian President Boris Yeltsin says Moscow "cannot break with leading world powers" over Kosovo. April 21: Two NATO missiles smash into the headquarters of Yugoslavia's ruling Socialist Party. April 23: NATO bombs the headquarters of Serbian state television. NATO leaders in Washington rebuff as inadequate an offer by Milosevic to accept an "international presence" in Kosovo. April 28: Yugoslav Deputy Prime Minister Vuk Draskovic is dismissed after he accuses the country's rulers of "lying to the people." May 1: Forty-seven bus passengers are killed when NATO bombs a bridge in Kosovo. May 2: Three captured US soldiers are released into the custody of US civil rights leader Jesse Jackson. May 5: NATO claims that they suffers its first losses when the two-man crew of a US Apache attack helicopter die in a crash in Albania. Rugova is released by the Yugoslav authorities and flies to Rome. May 6: Foreign ministers from the Group of Eight (G8) agree on a framework for a peace plan which calls for the return of all refugees and the deployment of an international "security" force in Kosovo. May 8: The Chinese embassy in Belgrade is hit by NATO missiles which kill three people. NATO describes the bombing as a "tragic mistake" caused by "faulty information." May 10: Yugoslavia begins proceedings before the UN International Court of Justice in the Hague, accusing NATO of genocide. Belgrade says it has begun pulling troops out of Kosovo. May 13: NATO dismisses as insignificant a reported pullout by 250 Yugoslav troops. May 14: At least 79 people are killed and 58 wounded when NATO missiles hit Korisa, a village in southern Kosovo. May 19: Milosevic and Russia's Balkans envoy Viktor Chernomyrdin back a settlement of the Kosovo conflict within the framework of the United Nations. May 21: Russia says mediation efforts with the West are deadlocked. A NATO bomb kills 10 inmates in a Pristina jail. May 22: A UN humanitarian mission visits Kosovo, as NATO admits bombing a position held by the KLA. May 23: Fighting flares on border between Serb forces and Albanian police. President Bill Clinton says he no longer rules out "other military options". May 26: NATO agrees to boost the number of troops in a future Kosovo peacekeeping mission from 28,000 to 45,000. May 27: Milosevic and four other top officials are indicted for war crimes by the International Criminal Tribunal in The Hague. May 29: Yugoslavia says it has accepted the Group of Eight principles for a peace deal in Kosovo. May 30: NATO says it wants a clear, personal statement from Milosevic that he accepts alliance conditions before it will halt air raids. A German soldier dies when a tank crashes off a bridge in Albania. May 31: At least 20 people are killed at a sanatorium at Surdulica, southern Serbia. NATO denies that its missles are responsible. June 1: Belgrade says in a letter to Bonn that it "has accepted the G8 principles." European, US and Russian envoys meet in Bonn to hammer out a common policy for a peace mission to Belgrade. 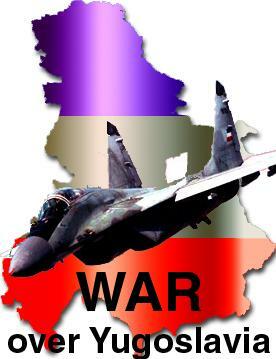 June 2: The International Court of Justice rejects Yugoslavia's petition to order an end to NATO airstrikes. EU and Russian envoys travel to Belgrade for talks with Milosevic and hand him a peace plan worked out in Bonn with US Deputy Secretary of State Strobe Talbott. June 3: Talks in Belgrade resume for a second session. A Russian spokesman in Moscow says Yugoslavia viewed the peace plan as a "realistic" way out of the Kosovo crisis.